John McCain: "It has a lot to do with whether a trade representative is for free trade or not." WASHINGTON -- The latest delay in launching the renegotiation process for a new North American Free Trade Agreement isn't coming from President Donald Trump's opponents -- it's coming from his own Republican side. The confirmation of Trump's trade czar has previously been held up by a combination of procedural issues, and the latest one involves questions about trade policy from inside the president's own party. It's delaying unanimous consent to proceed with a vote that would confirm Robert Lighthizer as trade czar, let him get involved in the U.S.'s 90-day consultation process before trade talks, and allow negotiations with Canada and Mexico to start by early fall. And it's coming from a well-known senator: John McCain. McCain declined to divulge the substance of his questions, saying it was a matter between him and the nominee. But he brushed off the idea that it's a personal grudge, given that Lighthizer wrote a mildly critical newspaper column in 2008 that said McCain's support of free trade didn't prove he was conservative. 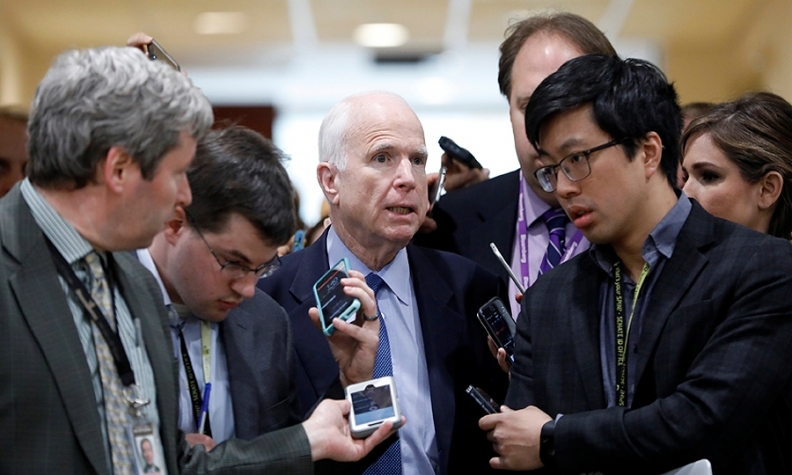 McCain said his questions involve basic trade policy. On NAFTA, some people are feeling pressure from the clock. With the Mexican election approaching and the U.S. midterms elections shortly thereafter, both the Mexican and American administrations have said they want a deal before mid-2018. Failure to get a deal within a few months could delay the process into 2019. That's why Trump and his commerce secretary have expressed increasing frustration with Congress in recent days, urging it to get going. A senior senate staffer insisted Lighthizer's confirmation is a fait accompli -- it's just a matter of timing: "He's gonna get confirmed. The leader (Mitch McConnell) hasn't scheduled it yet." He said it could happen any day, although that's been the standard position for a while. Democrats sound willing to support Lighthizer. The progressive, trade-skeptical Sherrod Brown of Ohio said he's spoken to Lighthizer four times since his confirmation hearing, really likes him, and can't understand what's taking so long. "I think he's one of the best -- maybe the best -- single Trump nominee so far," Brown said. Republicans "can point fingers at anybody they want. But it's a Republican senate with a Republican senate leader. I've tried to help Lighthizer. I don't know what the holdup is but I know (Senate Leader Mitch) McConnell and Trump aren't doing their jobs." Democratic senator Claire McCaskill concurred: "They're having trouble on their side of the aisle. It's not us." This bizarre role-reversal reflects the fact that, in U.S. politics, attitudes to trade don't follow neat partisan lines. And whatever lines existed are shifting in the Trump era, according to a new poll. A survey conducted in the runup to the renegotiations of NAFTA finds majority support for the agreement in all three countries involved. The Pew Research survey finds that of those who took part in the poll, 76 per cent of Canadian respondents, 60 per cent of Mexicans and 51 per cent of Americans supported NAFTA. But there's turbulence under the surface of U.S. public opinion. The poll suggests a massive gap in partisan attitudes, with only 30 per cent of respondents who voted Republican supporting NAFTA compared with 68 per cent of Democrats. That's the opposite of the partisan breakdown of a few years ago -- and suggests a major Trump effect. Republicans are suddenly the more trade-skeptical party, in keeping with Trump's attitude and shifting away from the views of senate Republicans -- like John McCain.